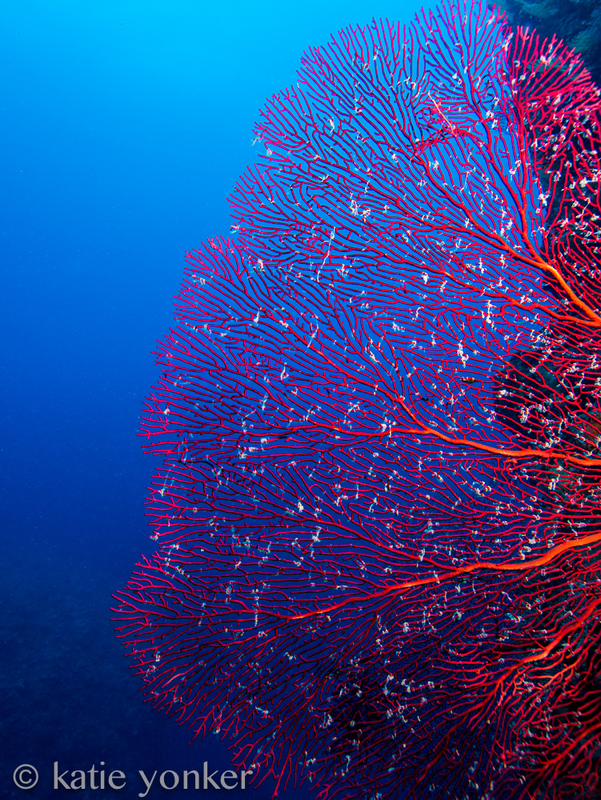 Jacques Cousteau famously coined this nation the “Soft Coral Capital of the World,” and rightfully so. 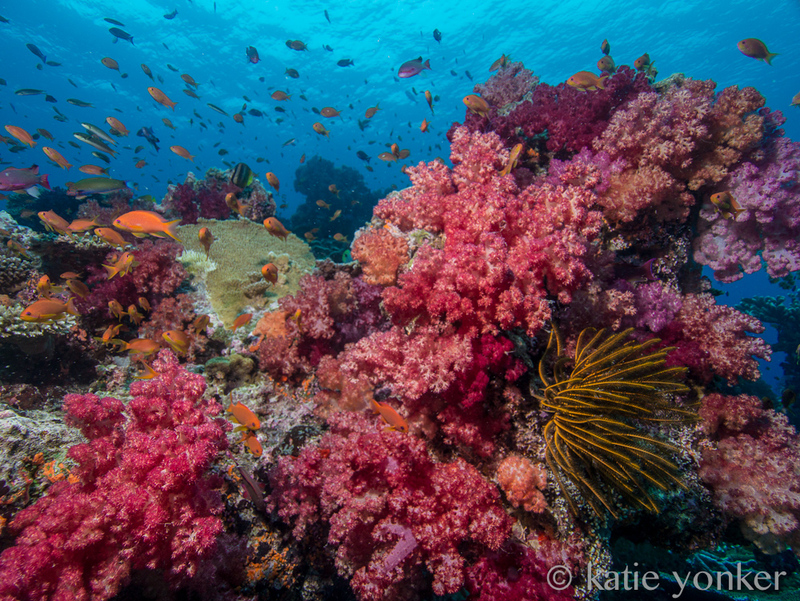 For many, simply hearing the name Fiji conjures up glossy magazine images of exquisite diving featuring coral in all colors of the rainbow. 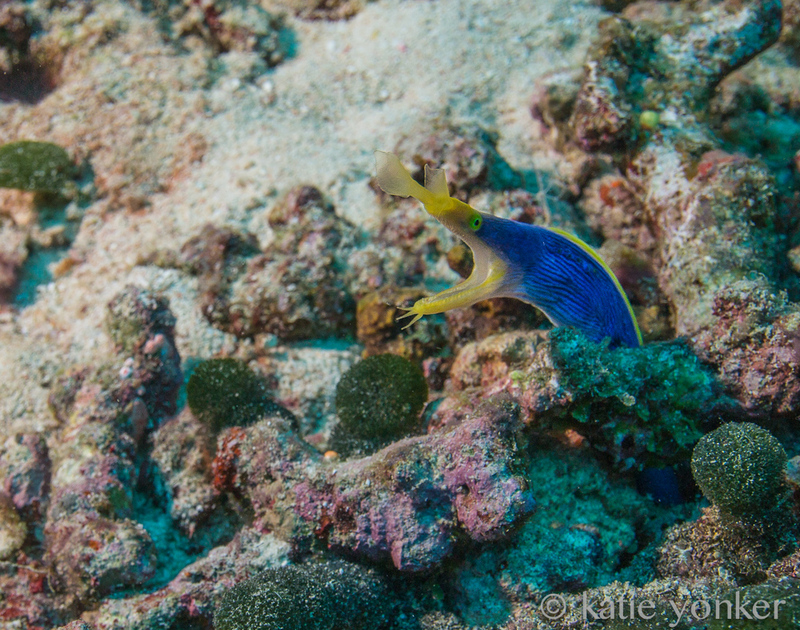 I had the opportunity to visit Fiji in February and for me, the diving only told part of the story of this island nation. 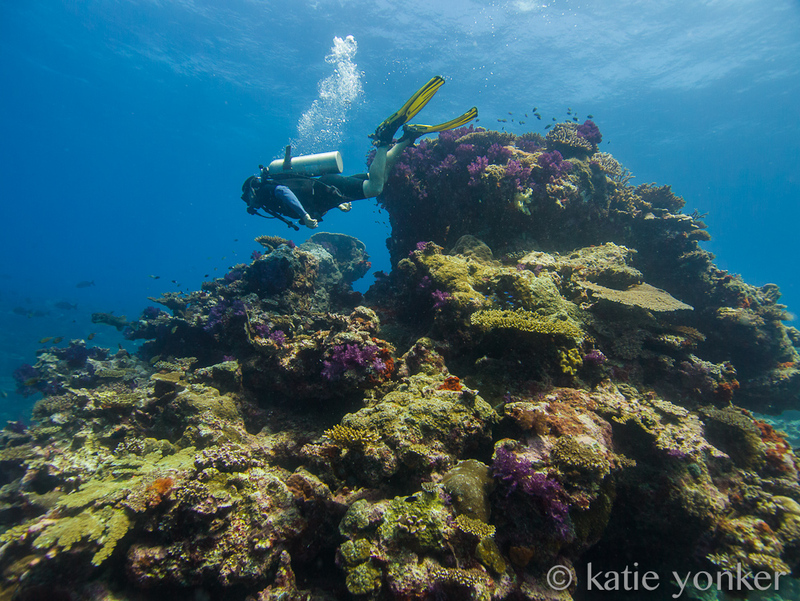 The beautiful topside scenery, authentic cultural experiences and unparalleled hospitality put this place on the top of my list of must-visit places for divers and non-divers alike. Fiji is an archipelago consisting of over 330 islands, several of which are uninhabited. 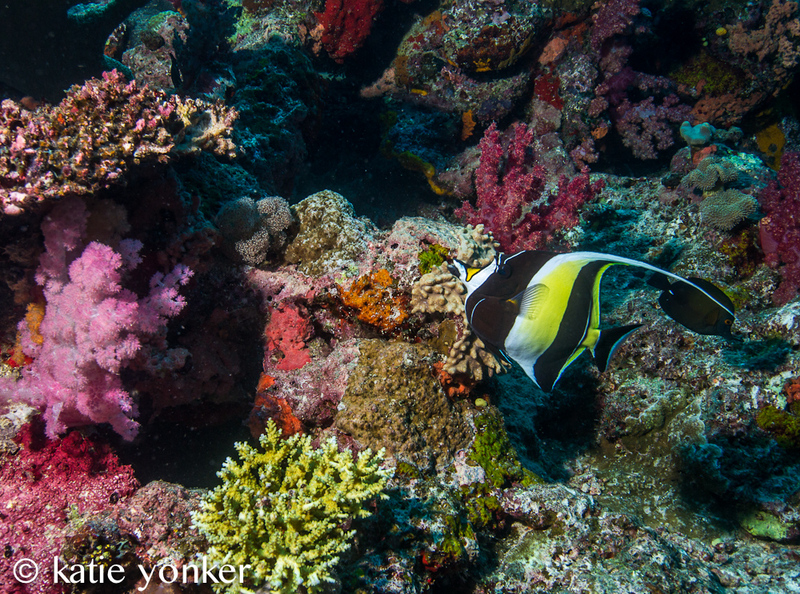 Divers tend to focus their itinerary in the Bligh Waters, typically accessed by liveaboard, or near the Rainbow Reef located between the islands of Vanua Levu and Taveuni. 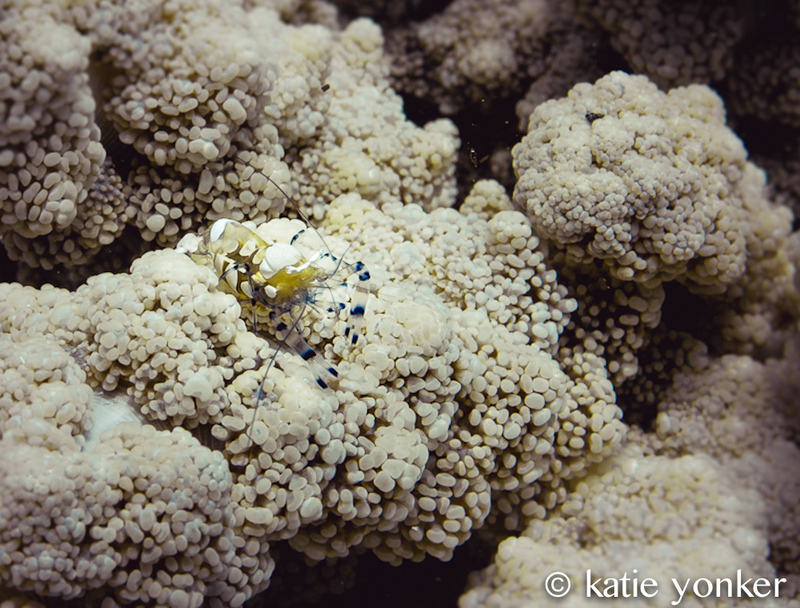 While it’s true some of my favorite dives were in those areas, I was pleasantly surprised by the abundance of macro life off the shores of the less visited areas. For those coming from LAX, I highly recommend the direct flight on Fiji Airways. I took a more adventurous route from Los Angeles to Honolulu, Honolulu to Apia, Apia to Nadi, an interisland flight to Kadavu, and a 1 hour boat ride. 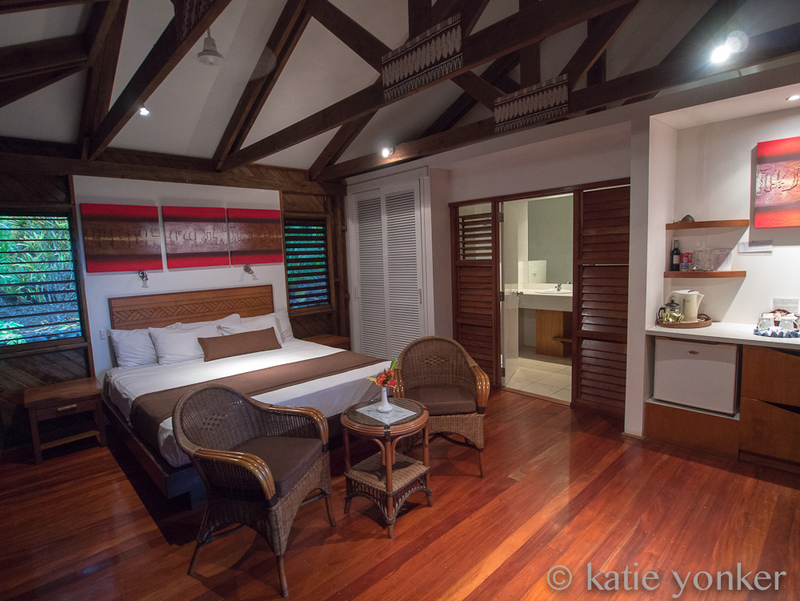 After a long, sleepless trek of nearly 2 days of travel, I was ready to check in to my bure and relax! I spent 3 nights at Matava, and I can’t think of a better place to have started my journey. 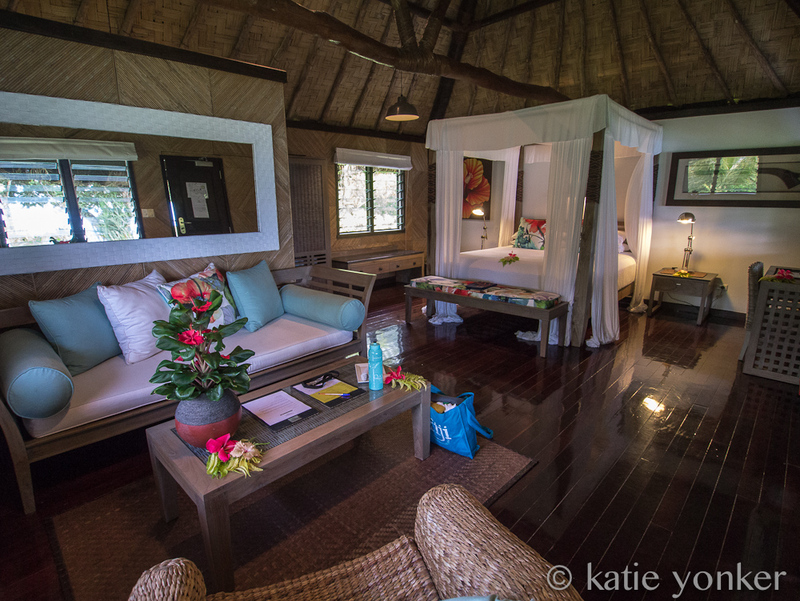 I received a warm welcome from the entire team and was whisked away (up several flights of stairs) to my private bure, which far surpassed my expectations despite the lack of air conditioning and electrical outlets. 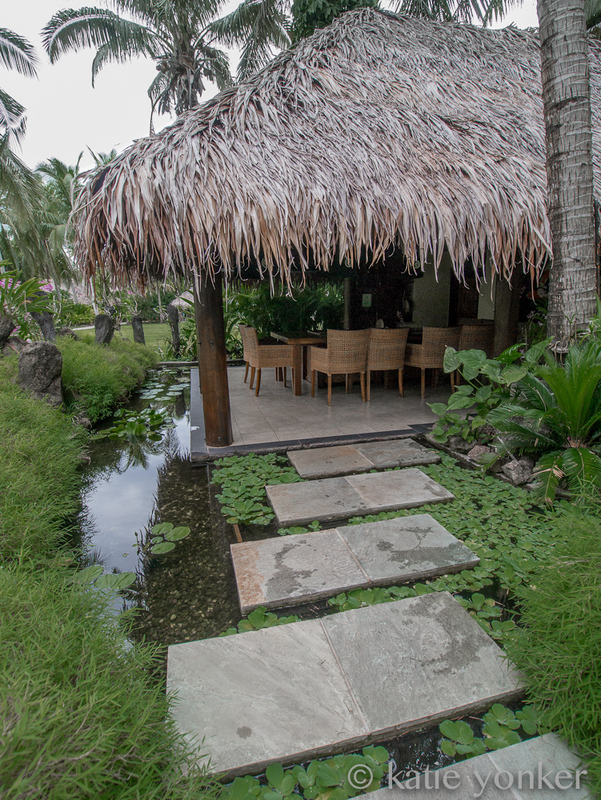 The views here are to die for, the food is delicious with many of the ingredients grown on site, and the entire Matava team embodies Fijian hospitality. 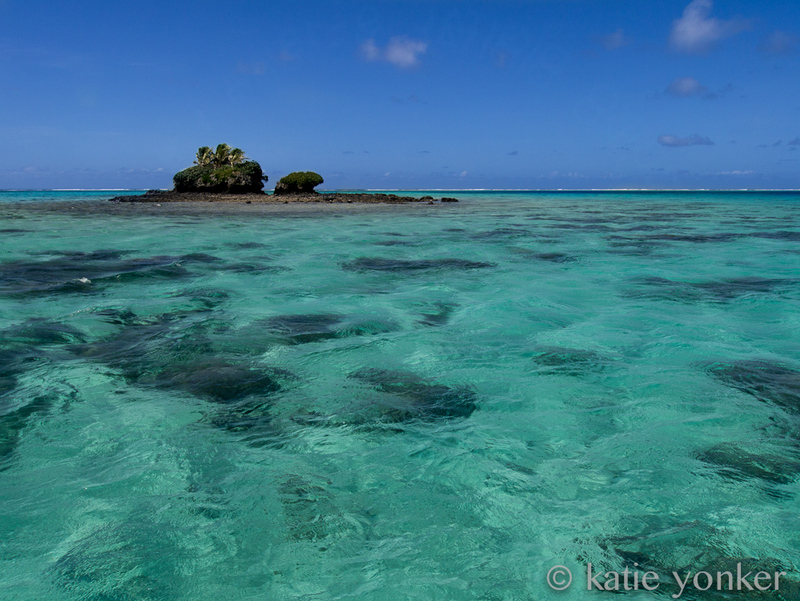 For those unfamiliar, Kadavu is a very remote island south of Viti Levu. There’s limited infrastructure and most areas are accessible only by boat. Kadavu is home to the Great Astrolabe Reef and divers in search of pelagics should consider a trip here to visit the Manta Point dive site. 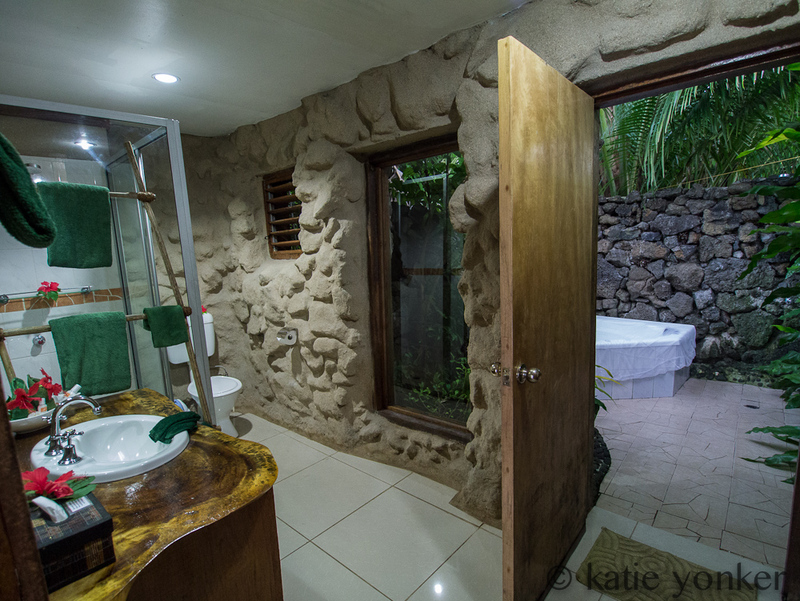 If you’re willing to truly disconnect (don’t panic, they still have Wifi,) Matava is a good choice. 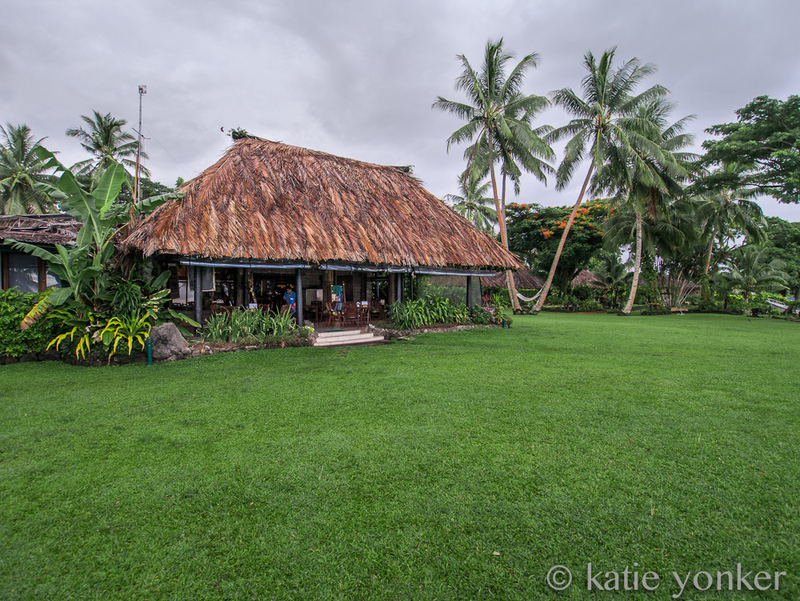 After a relaxing stay on Kadavu, I headed for Taveuni. I was forewarned about the one hour drive from Matei airport to Paradise Taveuni, at least half of which is on a bumpy dirt road. 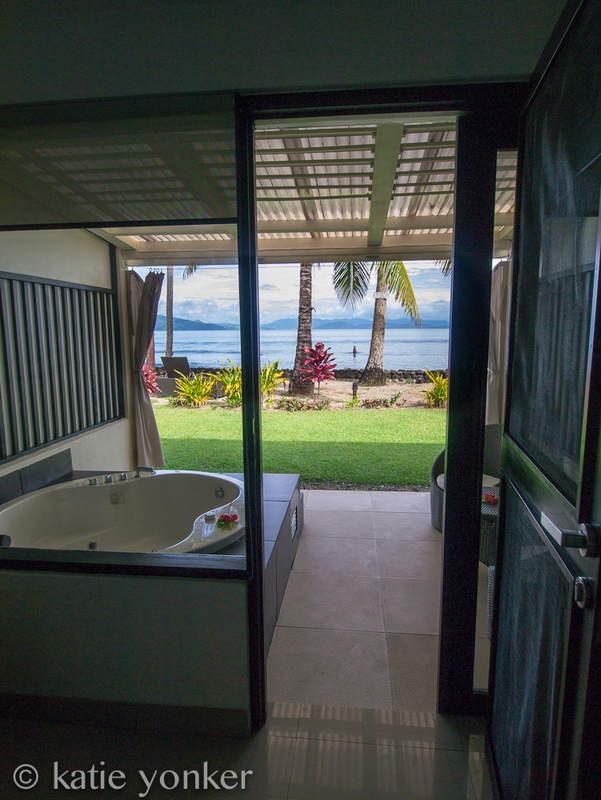 Quite the optimist, my driver suggested I think of it as “a free back massage.” It wasn’t as bad as I expected, and all thoughts of this so-called back massage quickly disappeared the moment I arrived at Paradise Taveuni. Because of its location south of town, the resort feels very private. The bures are large and feature individual outdoor spa tubs. 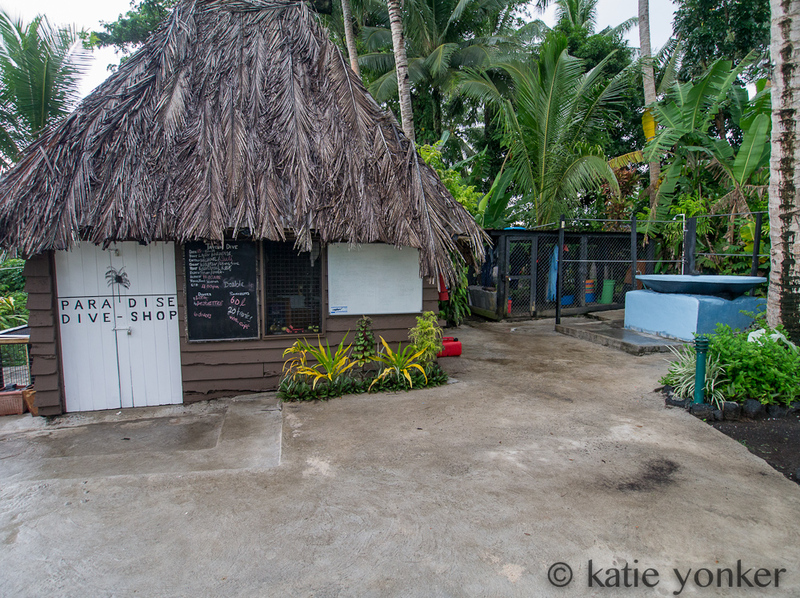 The on-site dive shop is just a few steps from your bure and although there’s no beach, there is a nice shore dive at the water’s edge where you’ll find resident blue ribbon eels. 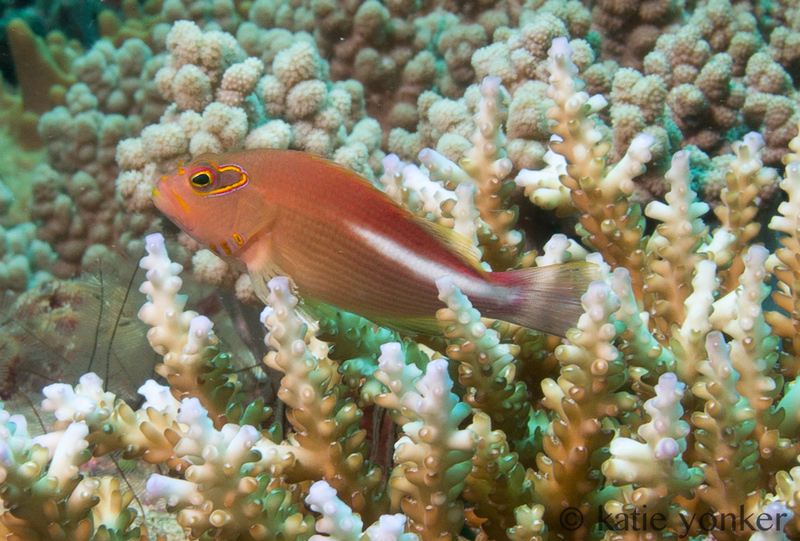 Some of my favorite dives in all of Fiji were at the Rainbow Reef, a 30-minute boat ride from the resort. 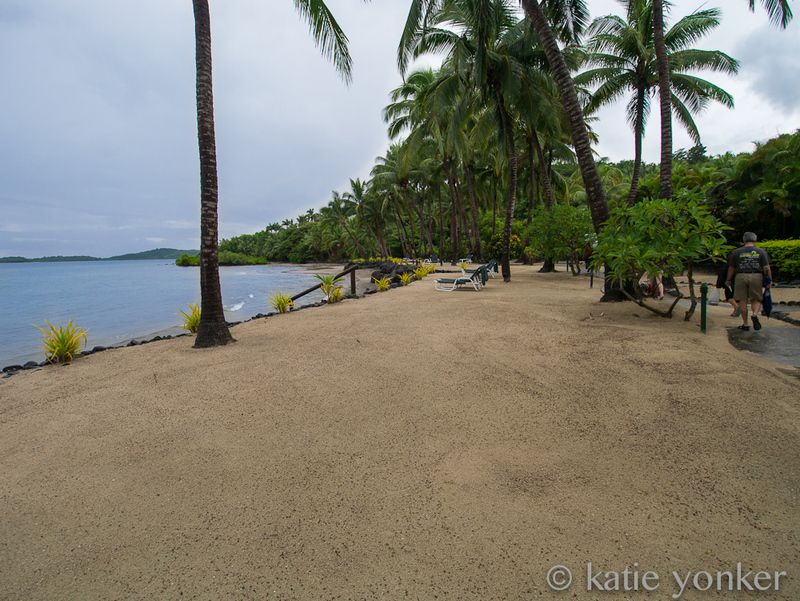 After a wonderful stay at Paradise Taveuni I headed 20 minutes north to Garden Island Resort. Owned by the Chi International luxury hotel brand, Garden Island is an upscale hotel with impressive water views from just about anywhere on the property. Being that it’s a hotel with hotel-style rooms (i.e. 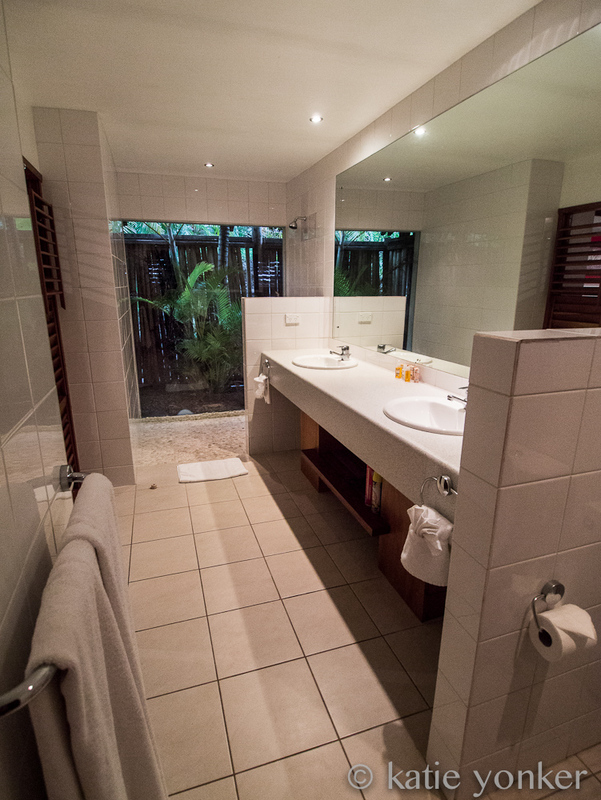 not individual bures) you’ll find many comforts of home such as air conditioning, strong water pressure, and in-room Wifi. Garden Island is also situated a short boat ride from the Rainbow Reef, and the on-site dive shop is just steps from your room. For those seeking a land-based excursion, take a trek across the street and through the jungle to the “water slide” where you can glide down a smooth, natural cascading series of small waterfalls. 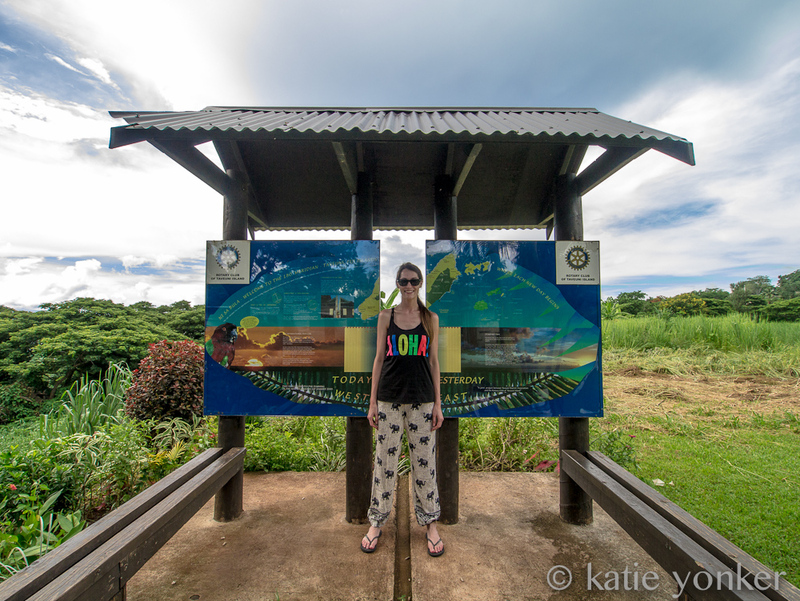 Just up the hill from the resort you’ll find the international date line - one of the few places in the world where you can stand in today and tomorrow at the same time. Or is it yesterday and today? 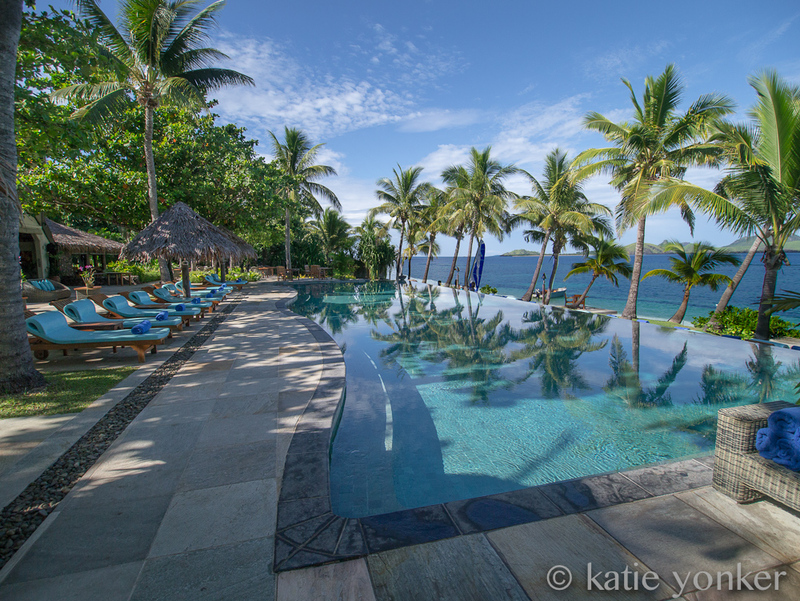 One seems to lose track of time while in Fiji. Next I headed to Qamea, a small island east of Taveuni. 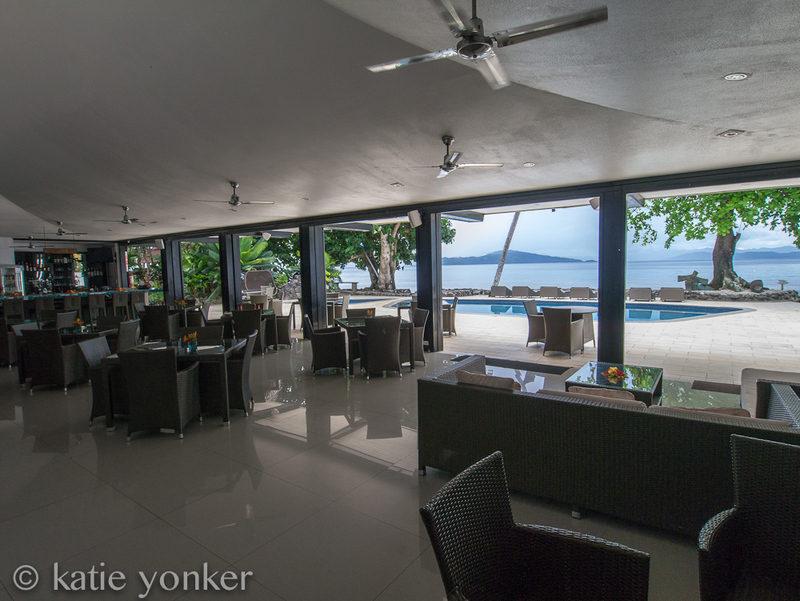 I knew when I arrived at Qamea Resort and Spa that I would not be ready to leave 24 hours later. 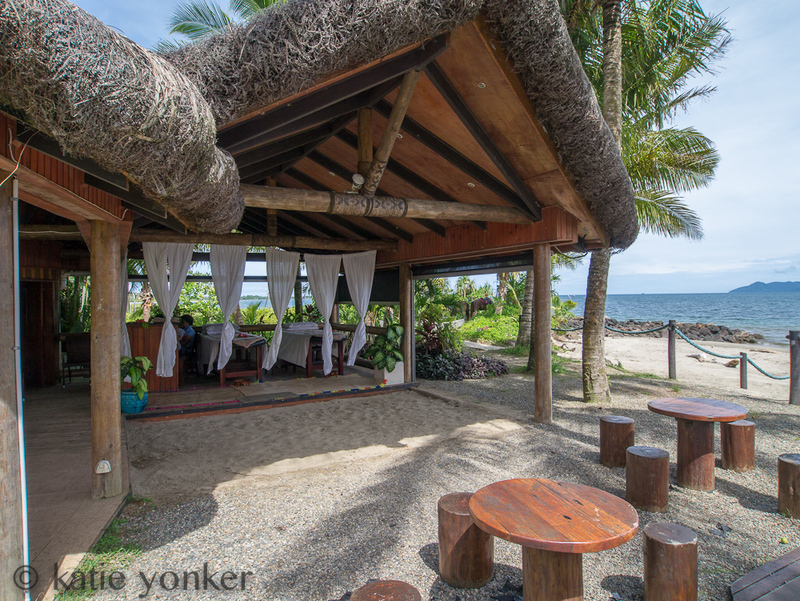 The bures at Qamea are stunning - the perfect mix of luxury and authenticity. 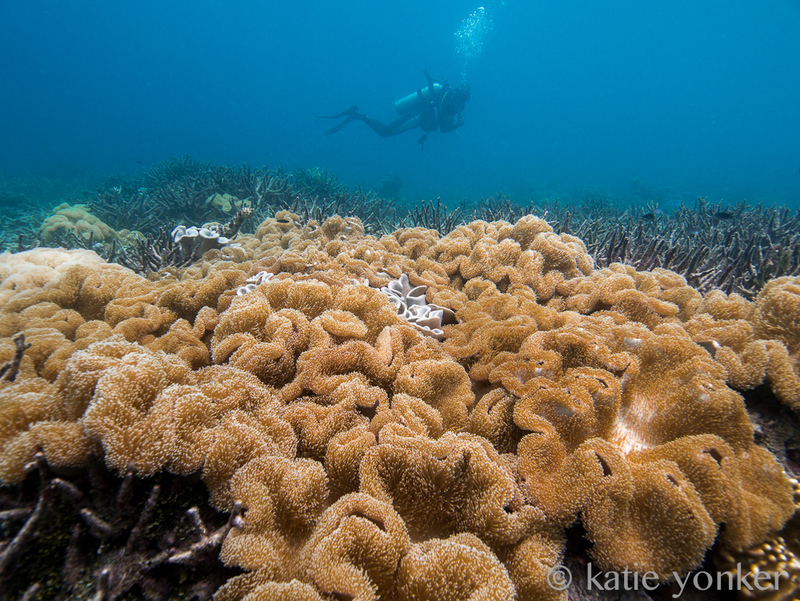 I was worried that I might have reached the apex of diving at the Rainbow Reef, but the sites at Qamea didn’t disappoint. I was impressed with the shore dive right in front of the resort, during which I must have asked myself a hundred times, “why didn’t I bring my macro lens!? !” If you have the opportunity to strike up a conversation with Sam in the dive shop, do it! 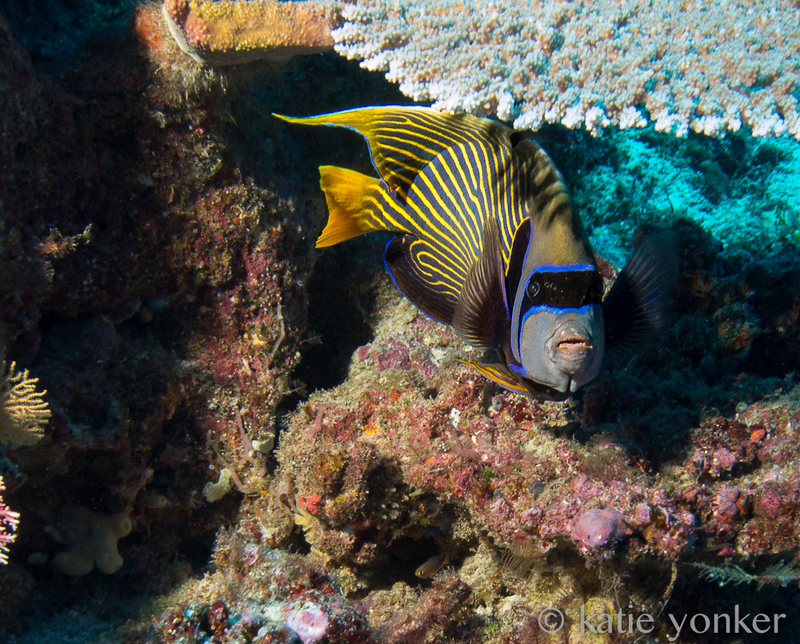 The guy has been diving in Fiji for a very long time and knows a great deal about local diving and their ecosystem. 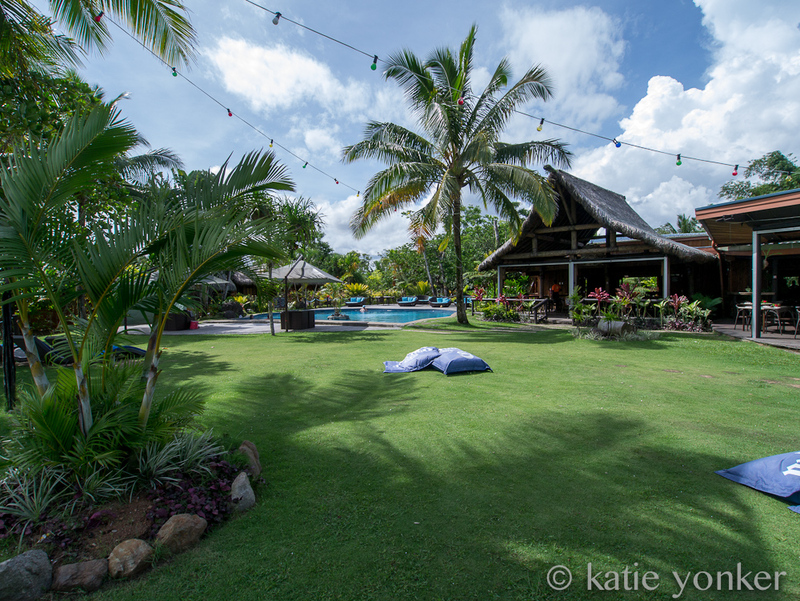 After a short stay at Qamea I headed back to Viti Levu for the start of Fiji Dive Fiesta, a weeklong event hosted by the tourism board intended to showcase some of the best dive resorts and liveaboards Fiji has to offer. 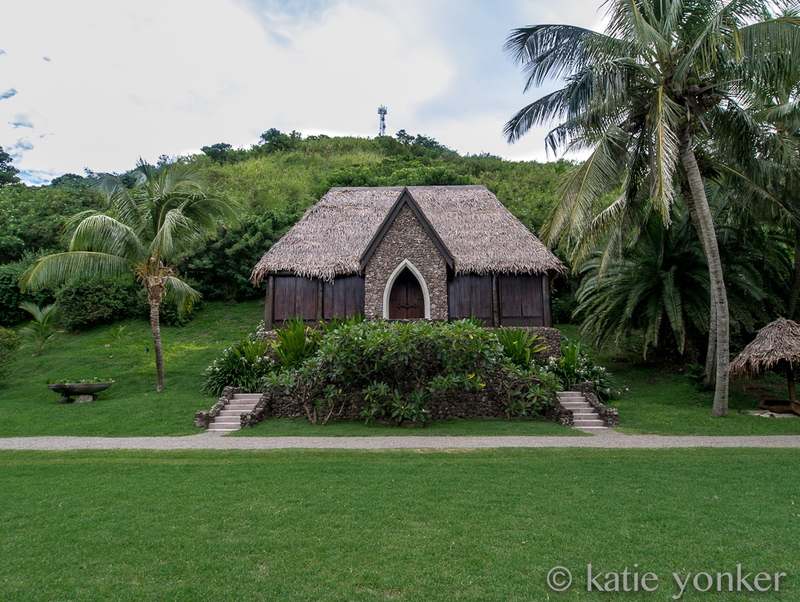 Our first stop was Wananavu, located on the northernmost point of the island. If you’re looking to dive the Bligh Waters but don’t have time for a 7-night liveaboard trip, Wananavu and Volivoli are really your only options, and you can’t go wrong with either. 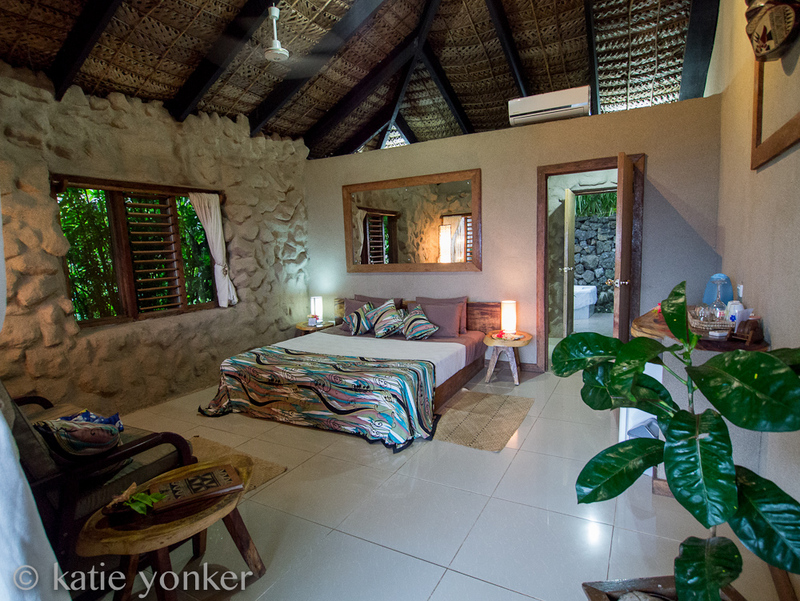 Both offer comfortable accommodations, restaurants with plenty of delicious food options, and great on-site dive operators. 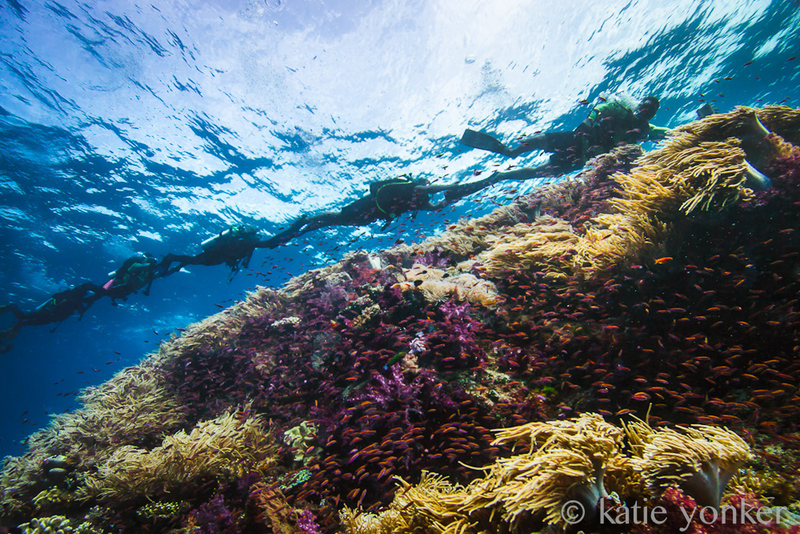 Next up was the much-anticipated liveaboard portion of the Dive Fiesta. The group was divided and half went on the Siren and half went on the Nai’a. As I boarded the Siren, my first impression was, “WOW, this is a nice boat!” Launched in September 2013, the Fiji Siren follows a similar layout to her sister ships and offers divers the same amenities you’ll find on all Siren boats including free nitrox, free rental gear and large cabins. 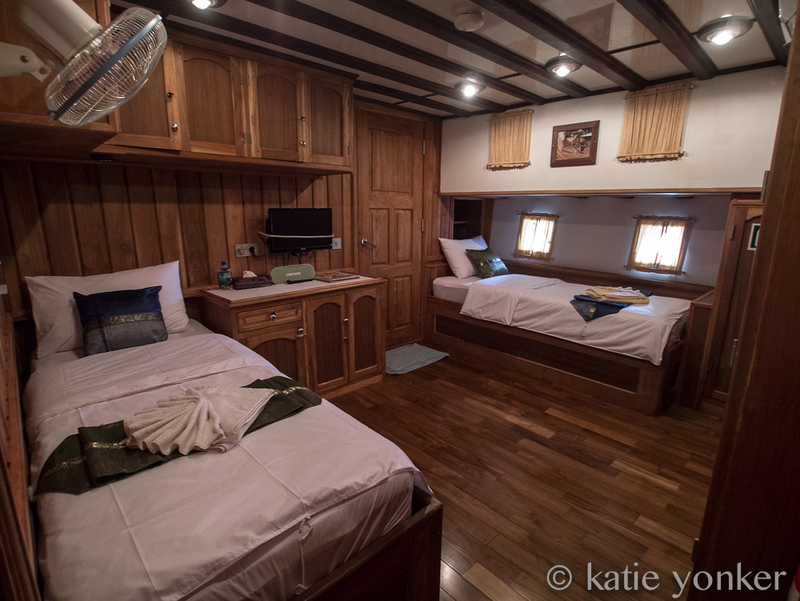 Every diver has individual storage space on the dive deck and two personal drawers in the galley, eliminating the need to run to your cabin when you realized you've left your hat down below…for the third time. 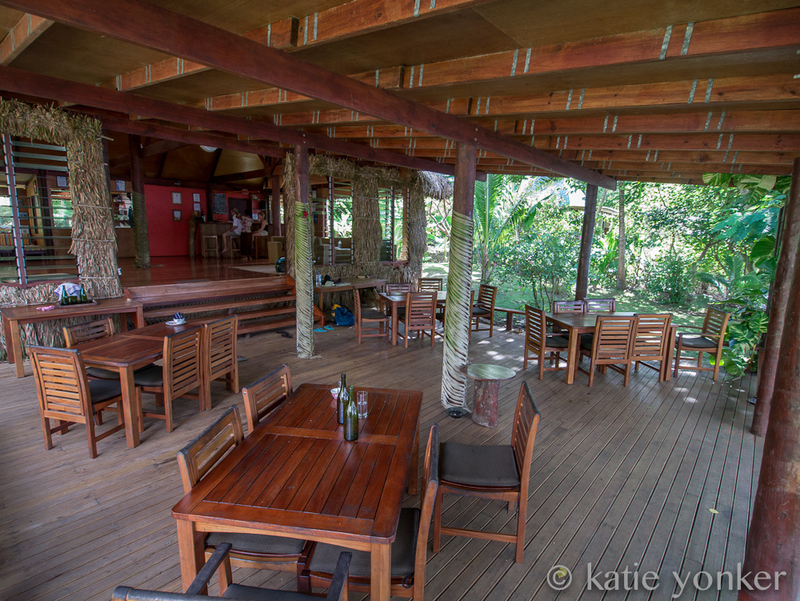 The outdoor dining area provides a great communal atmosphere and is the perfect place to relax and enjoy a cold brew from the tap (free, of course) after a long day of diving. I can’t say enough positive things about the Fiji Siren, her crew and the diving, and I would recommend it to anyone looking to experience some of the best diving in Fiji. I think I speak for just about everyone when I say no one wanted to disembark the Siren or the Nai’a. But alas, we packed up and headed south for the promise of diving with dozens of sharks. Pacific Harbor, Fiji’s adventure capital, will likely be your mainland-based destination if you’re looking to dive the famous Beqa shark sites. I had the privilege of diving with Aqua Trek’s Brandon Paige, the original creator of the Fiji Shark Dive. We loaded up the boat and made the short trip out to the site. 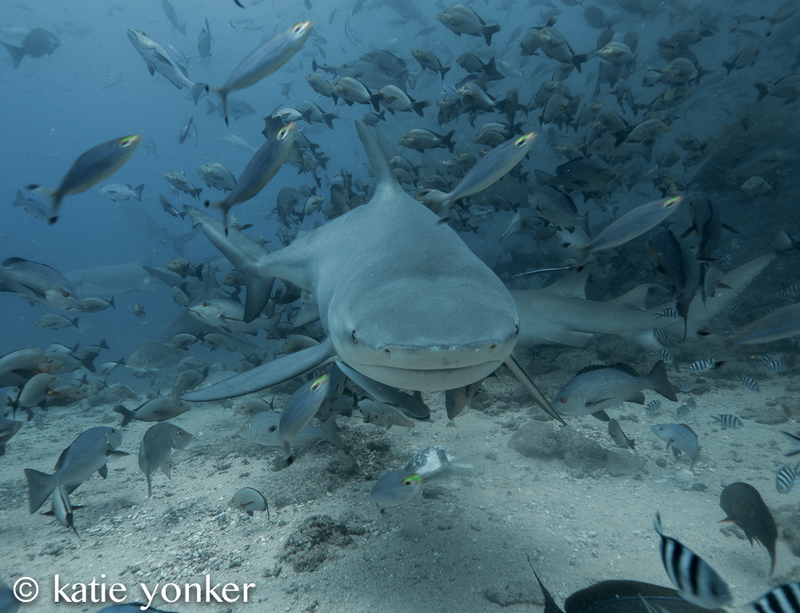 From the moment you arrive, several sharks can be seen cruising near the surface in anticipation of their next meal. We received a detailed briefing, hopped in, and made our descent. After 30 seconds of trying to shoot in manual mode with a strobe, I gave up, switched my camera to auto, and just started firing. There’s so much activity going on that it can be difficult to decide where to look. 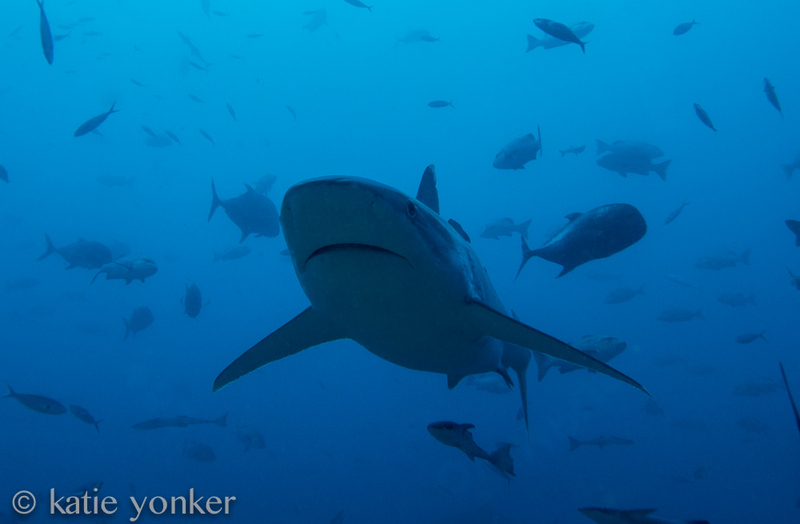 I’ve seen sharks many times before, but never have I been in the middle of a feeding frenzy. If you’re an adrenaline junky (check), love sharks (check), and want to have some great photos to show your friends when you get home (definitely), Beqa shark diving should be at the top of your itinerary. After our shark dives, my group headed back to Uprising Beach Resort, located just minutes from Aqua Trek. Uprising is a beachfront resort that has a large range of accommodations to suit any budget, a large on-site restaurant and bar, and is close to many Coral Coast activities. Our only day at Uprising was unfortunately coupled with temperatures pushing 100 degrees. Needless to say, I got very well acquainted with my bure…and its A/C remote. 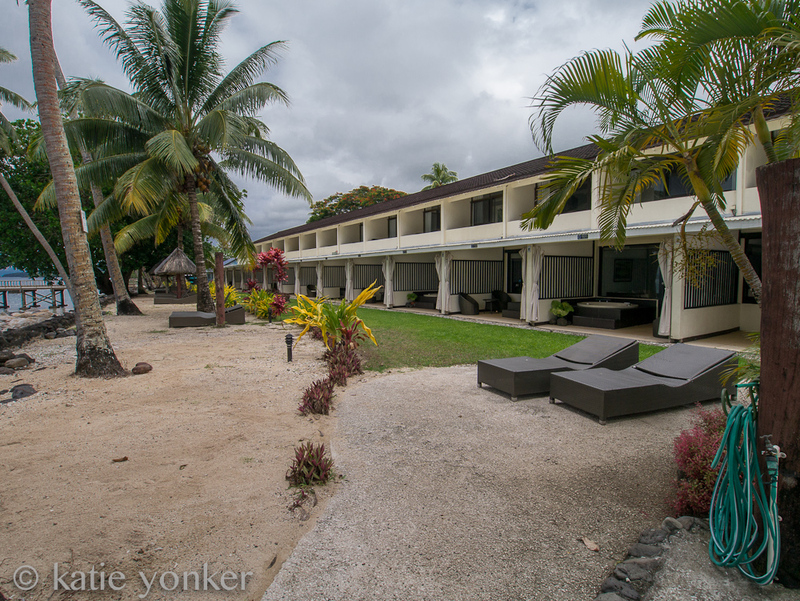 Our final resting place was the Warwick Fiji Resort & Spa, a 250-room hotel offering 5 restaurants, two pools, a spa, kids club, and several on-site activities. Our last day was spent attending the Fiji Dive Expo, which gave us the opportunity to meet with several resorts and dive operators throughout Fiji. I’d like to take a moment to give a special thanks to the Fiji Tourism Board for putting together this event. 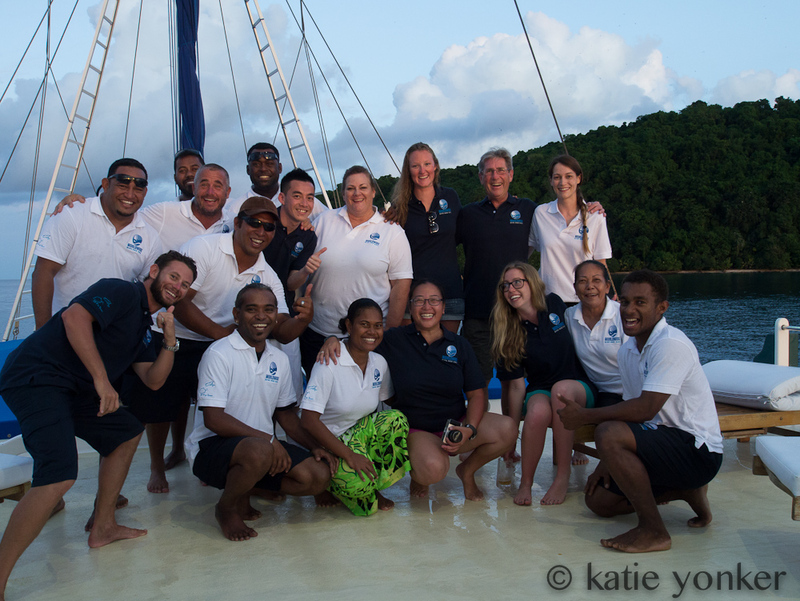 The Fiji Dive Fiesta was an invaluable experience for me and I’m grateful for the opportunity to have attended. As the Dive Fiesta came to a close it was time to say goodbye to my new friends. Admittedly, it was a sad moment. But the sadness didn’t linger too long, as I was about to embark for the Mamanucas to spend my last night in Fiji at Tokoriki Island Resort. 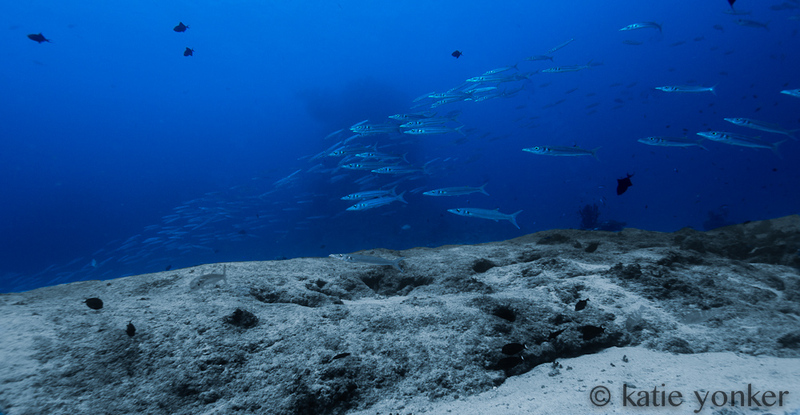 Known for its beautiful white sand beaches, the Mamanuca island chain is often overlooked by divers. For those who have the time, I highly recommend spending a relaxing day or two (or more) on one of these idyllic islands at the conclusion of your dive vacation. I’m happy to have chosen Tokoriki as my Fiji finale. The bures are beautiful, the restaurant serves a wonderfully eclectic menu, and the spa is excellent. After 17 days of being away from home, I was ready (yet reluctant) to head back to the states - and I was very happy to be taking the direct flight back to LAX! Whether you’re in search of excellent diving featuring colorful coral, waterfall treks, or just a relaxing stay on the beach, Fiji has what you’re looking for. It has become one of my most memorable holidays, and a destination that I will recommend to others without hesitation. I very much look forward to returning and receiving the big bula welcome that epitomizes authentic Fijian hospitality. 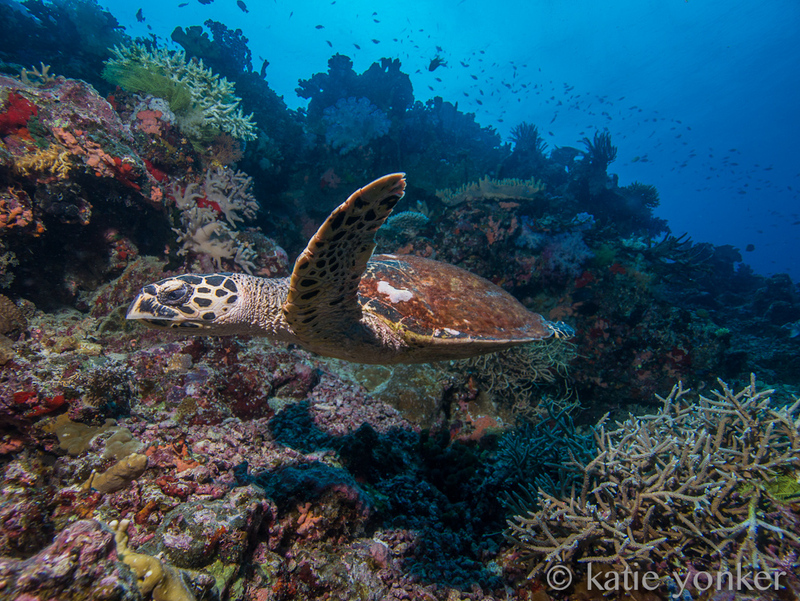 For more information on Fiji or to book your trip, email katie@bluewaterdivetravel.com. Katie Yonker is the Director of Operations for Bluewater Travel. 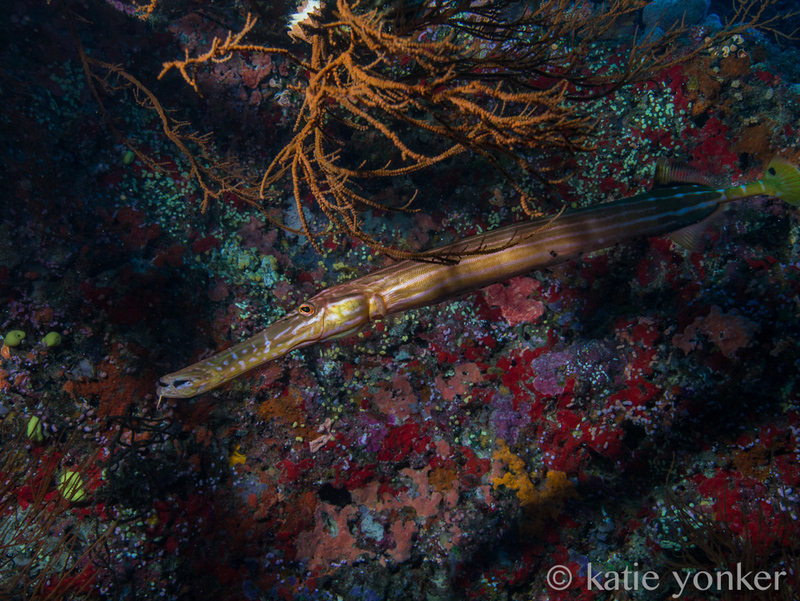 An avid diver and travel planner, Katie’s adventures have taken her to the far reaches of the globe to destinations such as Micronesia, Indonesia, the Philippines, French Polynesia, Palau, Australia, Fiji, Red Sea, South Africa, Maldives, Hawaii, Alaska, Cocos, Central America, the Caribbean, and many non-dive locations. 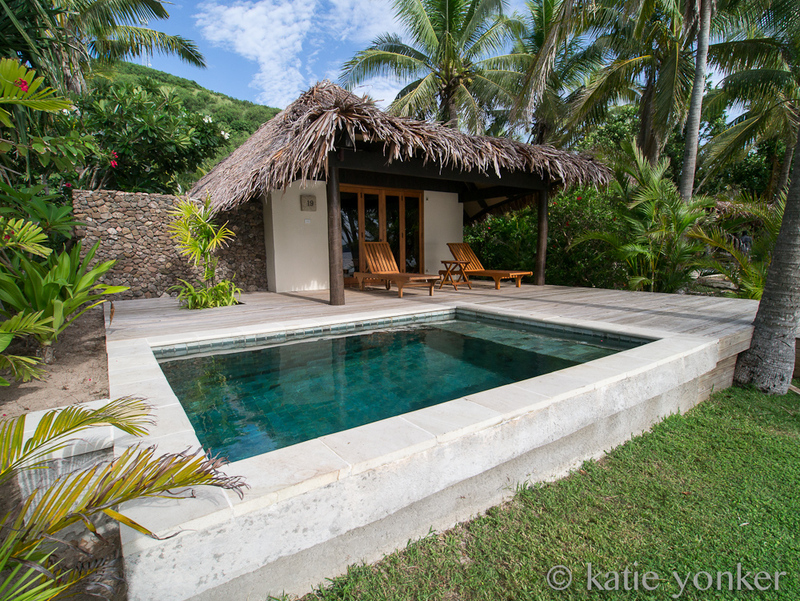 Want to join Katie on one of her upcoming trips? Permalink Submitted by Shawn on Thu, 11/27/2014 - 05:47. Permalink Submitted by Yuyun on Wed, 03/25/2015 - 19:44. Love these photos.. I have seen many who have had similar photos on their blog, but these are simply the best I've seen! The CAPTCHA is case-sensitive, and has NO SPACES. This question is for testing whether you are a human visitor and to prevent automated spam submissions.